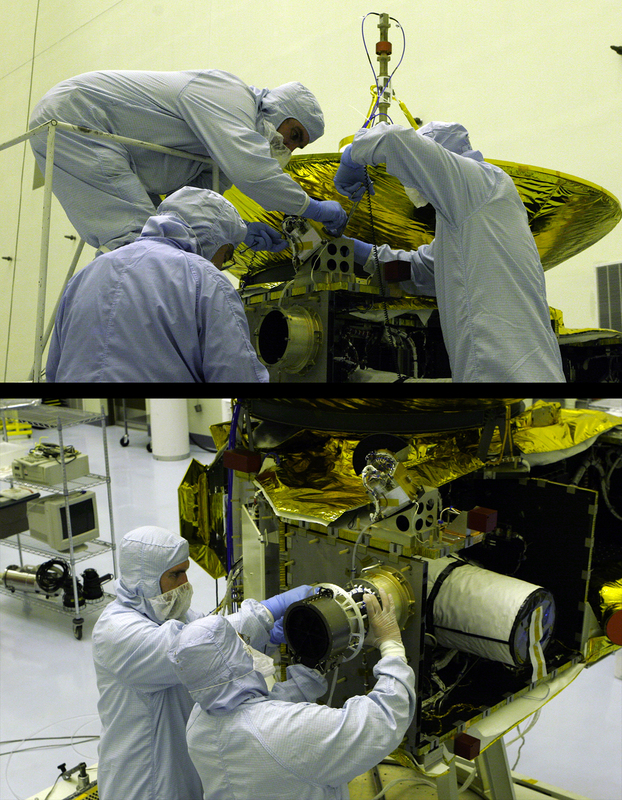 Technicians install and work on the Pluto Energetic Particle Spectrometer Science Investigation (PEPSSI, top) and Solar Wind Around Pluto (SWAP) instruments on New Horizons in 2005. PEPSSI was provided by the Johns Hopkins University Applied Physics Laboratory; Ralph McNutt of APL leads the investigation. SWAP was provided by Southwest Research Institute; Dave McComas of SwRI leads the investigation. As NASA’s New Horizons spacecraft approaches the Pluto system, its space plasma (also called charged particle) instruments —SWAP and PEPSSI — have already been taking measurements and assessing the space weather environment in the Kuiper Belt near Pluto. 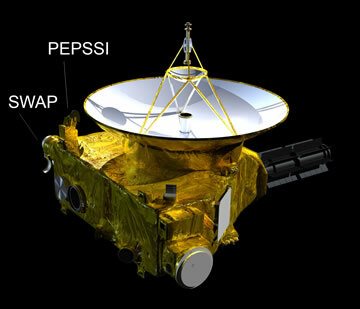 “Results from those measurements are being radioed to the ground and our team is already learning new things about the distant environment near Pluto’s orbit, 3 billion miles from Earth,” says New Horizons Principal Investigator Alan Stern, from Southwest Research Institute, Boulder, Colo. The solar wind consists mainly of protons and electrons, but also has trace amounts of ions of helium and oxygen that New Horizons detects. Typical solar wind speeds at Pluto’s orbit distance range from 350-500 kilometers per second (about 750,000-1 million miles per hour); typical densities of the solar wind near Pluto’s orbit are about 6,000 particles per cubic meter – about a 1,000 times less than the solar wind at Earth. For comparison, the Earth’s atmosphere at its surface is one hundred billion-billion times denser. How’s the Space Weather Out There?